Ingrida Circene, Minister of Health of Latvia, hosted the meeting, held on 13–14 December 2012. The policy dialogue enabled participants to discuss challenges in and policy initiatives for hospital reform in the Baltic states in the light of developments elsewhere in the WHO European Region. More specifically, it looked at how changes in the governance and payment of hospital care can improve the quality and cost–effectiveness of hospital activities. Over the past decade, the Baltic states have tended to reduce the number of hospitals and increase day care and ambulatory care. They have introduced case-based financing to control costs and increase efficiency in health care delivery. One session of the meeting considered the issue of cross-border cooperation. Although patients already use care services in neighbouring countries, there is great potential to increase collaboration on treatment, teaching and research across countries, especially in the light of the creation of reference networks at the European level. The common challenges discussed during the policy dialogue included how to ensure equitable distribution of hospital services, address workforce shortages, motivate doctors to work in rural areas and identify who should travel if necessary (the patient or the doctor). Policy dialogues provide policy-makers in a group of countries with a neutral platform on which to discuss key policy issues by comparing evidence and sharing experiences, without promoting any particular option or providing direct policy advice. WHO/Europe and the European Observatory on Health Systems and Policies have organized policy dialogues for the Baltic states since 2004. Previous dialogues focused on: health financing and purchasing services, human resources, provider networks and integrated care, the governance of hospitals and health financing agencies, policy options and governance issues in public health, health systems’ responses to the global economic crisis, access to medicines and integrated public health strategies to improve health and reduce inequalities. 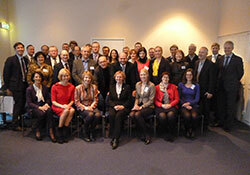 A new Health Systems in Transition (HiT) review of Latvia’s health system was launched during the 2012 meeting.